His name is Heroin Charly and he helped to kill my husband. I don’t mean that my husband is physically dead, at least not yet. It was only a matter of time in my opinion. I mean how many 60 year old junkies do you see walking around? Not many if you think about it. Charly was not really the blame, at least not by himself. He was killing himself too. You can always blame the “Pusher Man” (remember that old song? ), or you can blame the drug itself. You can even blame genetics if it makes you feel better, after all it is a disease. You can blame your wife, your life, your job or your God. It really comes down to choice. Blame the choice, and that is all. Not being an actual addict, you would think I could not possibly understand. Oh how wrong. I have lived with it in my life for 35 years. I have watched it change from a “softer” drug to the hardest possible. I have helplessly watched those choices change. I have watched the man himself change, slowly morphing into someone else, with only occasional traces of the original guy left. I watched it, fought it, despised it, and cried over it. I intervened. It worked for a very short time. Then along came relapse, an ugly monster. I was no match for any of this and I knew it. I was tired. Away, he went. I sent him away from me. Out of my face. I cannot watch it anymore, cannot live with it in my face anymore. For some years I was told , “You hold the key.” When I used the key, I was told, “you can’t bail out now.” “Oh watch me,” I cry, “just watch me.” …… “But it is a disease, he needs your support…..” “Where was my support for 35 years?”, I cry. I enjoy the quiet, enjoy the air smelling sweeter. I take back my home and hang new curtains, change something, anything. I feel more relaxed. I write and then write some more. I find something inside of me awakening, almost blossoming. No, not mid-life crisis, just………possibilities. That is it. Hope. I feel giddy sometimes with hope and possibilities for my future. I also feel selfish, but know that is the demon side of his addiction. It is not my addiction, though I played a role. Now I have stepped out of my designated role. That is what my best friend told me. She is right. When I see him, he looks sick. He looks like crap. I feel sad for him, so very sad that he has wasted his life. I feel sad that his possibilities are squashed, like a bug, by The Choice. My heart wrenches some, but my heart does not have too many wrenches left in it. A heart can actually become “wrenched out”, so to speak. A good captain goes down with his ship. I am not a captain and he is not my ship, but captain of his own ship. I do not hold the “Key”, at least not for him. Only for myself. He holds his own “Key”. Now it remains to be seen what he chooses to do with that “Key”. I saw Heroin Charly yesterday. I tried not to look at him, but he approached me. 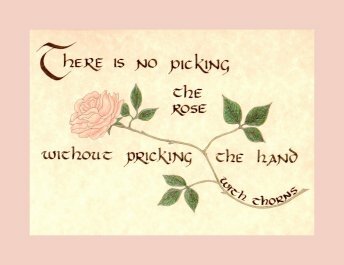 In his hand, he held a long stemmed pink rose that he had picked from someone’s yard. He reached out his hand and offered me the rose. I hesitated, and then took the rose. Charly said, “Be careful, watch out for the thorns.” His eyes were full of meaning. Maybe it was guilt, or sadness, or understanding, after all he did not ask to be an addict either. I looked at him square in the eye and said, “Thank you Charly, I always watch out for Thorns.” I took the rose and turned and walked away. I deserved that rose. I am, after all, a Heroin Widow. Is it not true, how God does work in mysterious ways? One does not always know just what is afoot. In finding our place, amazing things may happen. Never give up the knowledge of this. You are brave, yet you cannot know what wonders your strength may be working in others. This is the time, your true might coming forth, with all it’s secret forces. Your cape is in place, your Superpowers lit. Amazing message here, nice work. Never give up what you have found here, my Sister of the Soul. This is beautifully written. And it reminds me of a relationship I had with a cocaine addict. It was nowhere near as long as 35 years. But it was long enough. That relationship taught me alot about myself and how I feel about myself. It helped me to step up. To step out. To step away. And I haven’t looked back since. Powerful, I hope that many read this post of yours and feel it in the deepest parts of their being. Your strength gave me strength today for that I thank you from the bottom of my heart, thank you! Thank you all for your lovely words and encouragement. Hugs to you all. Your words ring a deep truth to us all my sister. to break the cycle that holds us all back!!!! Hugs to you, don’t cry, you will get me going! Thanks for always being there, sister. You have expressed the struggles, heartache, hopes, dreams, and reality I have felt as a result of having an addict in my life, but in a way I could not have expressed myself. Your words are powerful and your strength shines through. IThank you, I sometimes forget that I am not alone. i, sadly, understand both sides of that story. Sadly, Heroin Charly died from an overdose about 6 months ago, just thought I’d give you all an update.